It’s important to know who builds your home. Benchmark Communities homes for sale offers buyers a wide variety of elevations, locations and prices. Building in locations such as the West Coast, Pacific Northwest and Southeast states, Benchmark has you covered. When you enter a Benchmark home you can tell that they have a passion for design. Most all of their homes comes with many upgrades that you’d likely pay for at other builder developments. Benchmark Communities homes for sale are built with the home buyers highest expectations in mind and it’s the builders purpose to make sure that this mission never fails. Never sacrificing quality for profit, Benchmark makes sure to have the best personnel on their team. When building a Benchmark home the details are really what matters, coincidentally Benchmark makes sure to check and double-check the home through multiple stages to make sure the home is being built to the highest standards. The high level of customer service that Benchmark Communities provides to its home buyers has awarded them the acclaimed 2015 Eliant Homebuyers Choice Award. When you’re home buying search brings you to Benchmark Communities homes for sale you can rest assured that quality and financial stability are behind you every step of the Way. UCP, Benchmark Communities parent company is a publicly traded company that further solidifies their financial soundness. Check out our article on Bakersfield New Construction Builders, to learn more about other builders like Benchmark Communities. Located in Southwest Bakersfield, these new construction homes are sure to amaze. Don’t worry about all the great space you’ll have with the large rooms including dens, bonus rooms and great rooms, Benchmark Communities makes sure each home is maintained with proper energy efficiency. 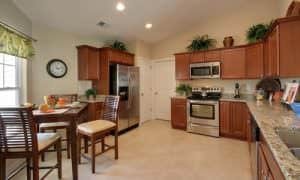 You’ll be impressed when you walk into any of the homes offered at The Heights, each house offers granite counter tops throughout, recessed lighting and even large outdoor living areas. You can be close to Seven Oaks without paying HOA fees when you buy a Benchmark Communities Homes for sale at The Heights! This community is located further south of Bakersfield but is still considered Southwest Bakersfield. Minutes from Highway 99 on Panama Lane, SW Bakersfield home buyers will have seven floor plans to choose from. This development is close to major shopping including Costco and offers some great schools within walking distance. If you’re interested in learning more about Benchmark Communities Homes for sale or would like a personal tour of one of the communities, please contact us! We look forward to serving you soon.